Hibiscus flowers are one of the most spectacular blossoms a container gardener can grow. The blooms are large, colorful and incredibly graceful. The foliage of the Hibiscus plant is also beautiful – the dark green, glossy leaves, provide a wonderful contrast to the extravagant blooms. Tropical Hibiscus flowers are one of the enduring symbols of the tropics. These much-beloved, large and showy flowers can be grown inside in temperate zones, but it’s not an easy task. The trick with success is twofold: managing the deadly winter, and fending off hungry insects. If you can fall into a rhythm, it’s possible to keep a hibiscus plant thriving for a decade or more, with blooms in the summer. Light: Place outside in the summer, gradually acclimating to more light. In the winter, give as much direct light as possible. Water: Water freely in the summer, but excellent drainage is a must. Never let the mix become soggy. In the winter, let dry almost completely before watering again. Temperature: Even a few nights below 50ºF (10ºC) will kill a Hibiscus. Move them inside when the temperature is consistently 55ºF (13ºC). They prefer between 55ºF and 70ºF (13ºC and 21ºC). Soil: Use a well-drained potting mix. Ensure also that the plant isn’t packed in too tight in order to keep its drainage is good. Poor drainage could rot the plant’s roots and slowly wear it down. Fertilizer: Feed in the early summer with a slow-release fertilizer or weekly with a liquid, blooming fertilizer. Repot as necessary, yearly or biannually. Hibiscus will grow into trees in their native habitats, but this may be unwieldy in a home setting. There’s also some benefit to keeping the Hibiscus in a relatively smaller pot, as it will make for easier pruning and moving. 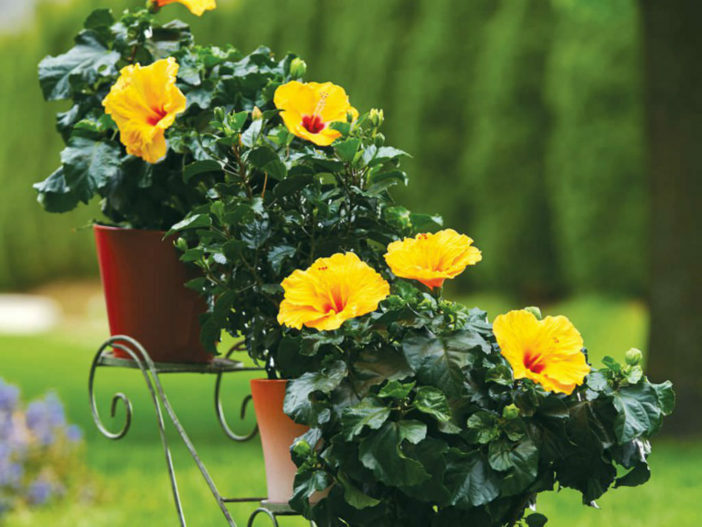 Failure to repot these plants often can leave them in soil without adequate nutrients for their survival, and repotting will often spur on growth if you’re finding that your Hibiscus plants seem to have stalled out. Watch out for falling leaves or other signs of stress. Hibiscus can be propagated with soft-stem cuttings in late spring, when the plant begins to grow again. Use rooting hormone and shelter the cutting from direct sun until it begins to grow. Many gardeners bag their plants, which seals in heat and moisture and increases newly planted cuttings’ chances of surviving. Don’t be discouraged if you can’t propagate your Hibiscus plants right away; it’s a process that takes time, even for experienced gardeners, and upon success you’ll find your new plants all the more rewarding. Trim the plant hard before moving it inside for the winter. It will go into near dormancy until late winter. After you trim it, but before you bring it in, treat it thoroughly for insects. Neem oil and liquid detergent work well, or use a hose to blast off insects. Once inside, don’t overwater, but provide as much humidity as possible, including daily mistings. Don’t expose to blowing air from vents. When the weather warms to above 50ºF (10ºC) at night, move it back outside and acclimate slowly.